The New Mexico State Library is hiring a Library Technician to operate one of our Rural Bookmobiles out of Los Lunas, N.M. Join our enthusiastic team of professionals delivering much-needed library services to New Mexico’s rural population! Please see information below and apply online at http://www.spo.state.nm.us. For official posting, click here. This position will provide library services to rural and under-served communities and patrons by driving a 35 foot bookmobile to designated rural areas where rural library patrons. This position will select library materials, and obtain current and accurate information via the Rural Bookmobile West program. The incumbent will assist in circulating and re-shelving library materials. This position will be keeping statistics of usage, and recording a log of vehicular maintenance in the library and on the bookmobile. The incumbent will maintain patron files and assists in compiling statistics for monthly and quarterly reports. The Daily bookmobile runs results in work schedules that often exceed 8-10 hours per day. The incumbent will share driving time of the 35 foot bookmobile with co-workers. Two employees are required to travel 3 weeks out of the month providing library services to the western region of New Mexico.This position is a Pay Band 45. Overnight travel is required. Bookmobile usually travels three out of four weeks per month. Sitting for long hours during bookmobile trips. Lifting and carrying luggage, laptops and books. Daily requirements of the position require carrying, lifting, bending, kneeling and standing while working with library materials; pushing or pulling book carts up to 40 lbs; occasionally moving shelving or cabinets; and the use of stools or step ladders to reach materials on high shelves. 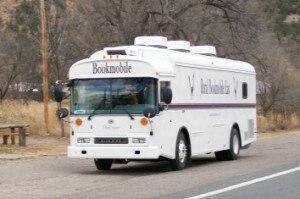 Driving bookmobile vehicle and state vehicle on narrow New Mexico roads, over mountain passes with high elevations, sometimes in adverse weather conditions (wind, rain and snow) in emergencies and usually between the hours of 6:30 a.m. and 8:00 p.m. year round. In the winter months there is evening driving after sunset. This position also requires exposure to Visual/Video Display Terminal (VDT) and extensive personal computer and phone usage.